If you hate being embarrassed when your friends hear you sing, this video will give you 3 secrets to help you know how to sing BETTER than your friends. Hi, I’m Chuck Gilmore, International Vocal Coach and Founder of Power to Sing. If you’re here for the first time, this is where you come for VIDEOS THAT HELP YOU to IMPROVE YOUR SINGING rapidly. Please SUBSCRIBE TO MY CHANNEL AND HIT THE BELL TO BE NOTIFIED WHEN I POST NEW VIDEOS EVERY FRIDAY! 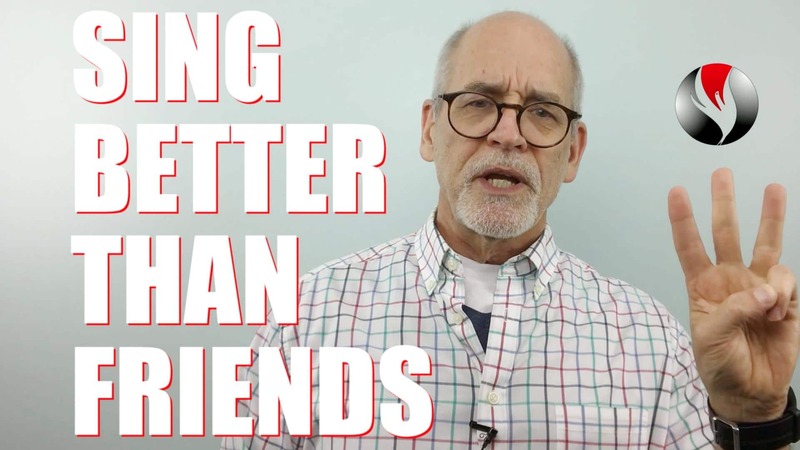 If you’re embarrassed or shy about singing around your friends because you don’t think you sing as well as they do, BY THE END OF THIS VIDEO, YOU’LL learn 3 secrets that your friends don’t know about that will make you a better singer. These secrets have helped THOUSANDS OF students AND NOW IT’S YOUR TURN! Secret #1:Your Vocal cords must come together appropriately firm in your lower voice…which is called Chest Voice. This gives the vocal cords a “friendly” compression that feels very similar to how you talk…if you talk normally. Do this exercise to help you feel it. Guys start on low C3. Girls an octave higher on middle C. Both voices go up 4 steps and back down. Feel a natural spoken feeling as you go up and back down again. Ney ney ney ney ney ney ney ney ney. Just do it very speech-like. Again: Ney ney ney ney ney ney ney ney ney. Secret #2: When you get to the top of your Chest Voice, you might think that’s all the further you can sing. You might think you can only sing higher by forcing the chest voice higher or breaking into falsetto. The secret is, it’s not the top nor the end of your voice. You do not have to force chest higher or break into falsetto. This area of your voice is the beginning of a transition zone to your higher voice, which is called Head Voice. This transition zone is called the bridge in your voice. Many popular singers have pulled the chest voice too high or broken into a falsetto tone. By the way, Who’s one of your favorite singers? Take a second and let me know in the comments section below. This will help you mix together your chest and head voice through the bridge. #1. Your Vocal cords must come together appropriately firm. #2. The top of Chest voice is not the top nor the end of your voice. It’s the beginning of a transition zone to your higher head voice. #3. It’s possible to blend Chest and Head Voice together as you sing higher. In order for you to know How To Sing Better Than Your Friends you must do special exercises for your unique vocal type. Your vocal type describes what your voice does when you sing through the bridge. To get your vocal type and the special exercises for your voice, download the Free PDF: Get Your Vocal Type. You’ll find it in this card or in the description below this video on Youtube. This PDF takes you to the vocal test where you’ll discover your vocal type; watch the videos and download the free exercises for your vocal type. Start practicing them to make immediate improvement. Soon, you’ll be singing better than your friends …and most everyone else. ALSO, if YOU WANT TO JOIN A COMMUNITY of other singers JUST LIKE YOU, I HAVE A Facebook page, Power to Sing, WHERE I SHARE more valuable singing secrets. IF YOU LIKE THIS VIDEO, PLEASE give me a thumbs up, SUBSCRIBE, AND SHARE IT WITH a friend. Let me know in the COMMENTS BELOW with the word “HELPFUL” IF THIS VIDEO HELPED YOU. In my next video we’ll dive deeper into the foundation of your voice, Chest Voice and find out why without Chest Voice, you’ll never succeed as a singer. I’m Chuck Gilmore with Power to Sing. I’m going to help you sing higher with beauty, confidence and power. I’ll see you inside the next Video. Why I sing to my girlfriend to her?? ?